Dae-Ho Lee hits two home runs and Kyle Seager hits one to help the Mariners pick up a 7-5 win over the first-place Rangers on Friday night. Dae-Ho Lee presented his Mariners teammates with a little gift before Friday’s game against Texas, a necklace with a charm from his native Korea that he said improves blood circulation. 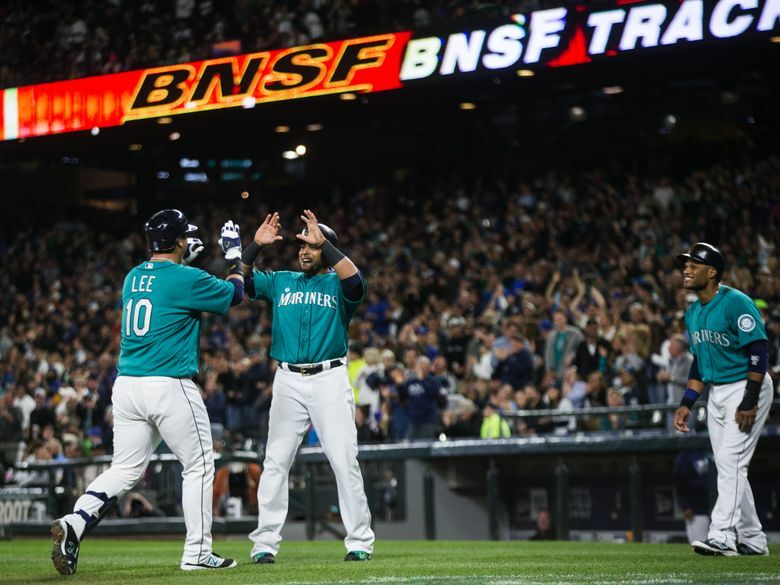 Then when the game began, Lee put some electricity into Safeco Field — as well as some runs on the scoreboard — by hitting two home runs to lift the Mariners to a much-needed 7-5 win over Texas. It was also the fourth straight game in which the Mariners had a player hit two home runs in a game, tying major-league record set by Cleveland in 2000. And Lee’s two homers, combined with a solo shot by Seager, gave Seattle 92 for the season, the most in the majors. Most important to manager Scott Servais, all the offense gave the Mariners the win in the first game of maybe the most important series so far this season. The Rangers entered the night four games ahead of the Mariners in the AL West thanks in part to a sweep of Seattle last weekend in Arlington. Lee hit a solo homer in the second inning to put Seattle ahead, 1-0. After Ian Desmond tied it with a solo homer in the third — one of four for Texas on a night in which the two teams combined for seven home runs — Lee hit a three-run shot in the fourth to put the Mariners ahead for good, 4-1. Seager followed with a solo shot, the first time this year Seattle had hit back-to-back homers, to make it 5-1. The home runs gave the 33-year-old Lee 10 in 102 at-bats in his first major-league season. The Mariners signed Lee in February hoping he would add right-handed power. But Servais said that Lee, who is hitting .301, has probably contributed more than the team had reason to hope. All three Seattle homers came off Texas starter Derek Holland, who had beaten the Mariners twice this season, including last weekend in Arlington. He also came in with a reputation for being something of a Mariner killer in Seattle. He was 4-1 at Safeco Field before Friday night, allowing just 10 earned runs in 46 innings, which included pitching eight innings of an 8-0 Texas win here on April 12. Lee was among those who had struggled previously against Holland, entering the night 1 for 6 against him this year. Texas hit three solo homers off Seattle starter Hisashi Iwakuma. But after a somewhat shaky beginning — he allowed five hits in the first three innings — Iwakuma settled down to retire 10 in a row in the middle innings as the Mariners pulled ahead. It’s only June, but Iwakuma didn’t downplay the meaning of the game. “They got us the last three games in Texas, so we had to get them back,” he said. The Rangers, in fact, came in having won 27 of their last 40 to take momentary control of the AL West, the best stretch in that time other than the Cubs. Texas closed the gap to 5-4 in the eighth. But closer Steve Cishek came on to get the final out of the eighth, stranding the tying run on second. Seattle used some heady base running by Nelson Cruz — who reached on a wild pitch on strike three to lead off — and some sloppy play by Texas to score two more runs in the bottom of the eighth. That helped make irrelevant the second homer of the night by Mitch Moreland with two outs in the ninth as Cishek finished it off to get his 14th save of the season. Left-hander James Paxton will pitch for Seattle Saturday against right-hander Colby Lewis in a 7:10 p.m. start.